ELIZABETH CITY, N.C. – Ever wondered how much a Ram truck can actually tow? The answer is an entire parade––one of the biggest parades in America, in fact. Ram is the official truck of the Macy’s Thanksgiving Day Parade this year and you can bet they're kicking off the holiday season the right way. Ram is providing the Macy’s Parade with about 70 trucks and commercial vans. You can see 25 of these trucks towing your favorite floats through New York City on the day of the parade. The other 45 will be used behind-the-scenes for transporting tools, moving materials, costumes, and much more. 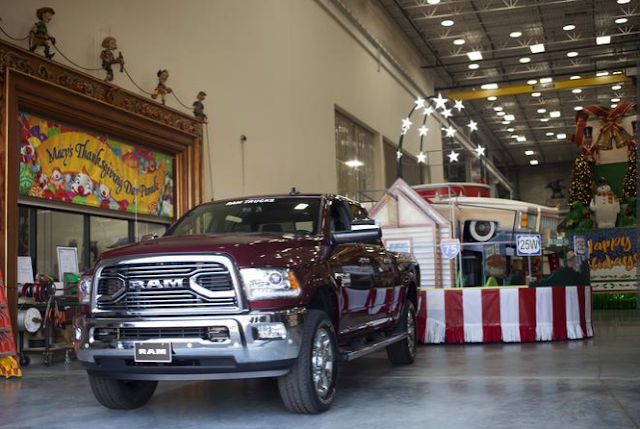 With Ram as the official truck of the Macy’s Thanksgiving Day Parade, it gets a chance to showcase its style, innovation, and towing capability. There’s no doubt that the Ram trucks will be able to transport the floats with ease and take on the challenges of preparing for the big day. Besides the Macy’s Parade, Ram is kicking off this season with a giveaway promotion. To recognize the hardworking men and women of America, Ram is giving a grand prize of a $15,000 voucher towards a two-year lease on a new 2015 or 2016 Ram ProMaster City, and up to $5,000 toward up-fits for the van. If you’re interested in nominating a local volunteer in your community, visit www.ramtrucks.com/ramgivesthanks between Nov. 25 and Jan. 4. Tune into NBC for the Macy’s Thanksgiving Day Parade on Nov. 26 at 9 a.m. to watch the Ram trucks make their debut with the other 3.5 million spectators in NYC and 50 million television viewers! Want a Ram truck for yourself? Come by our Ram deal near South Mills, NC to take one for a test-drive. We’re happy to help you with anything you need to find the perfect vehicle. Perry Auto Group has two dealership locations to serve you better at 1005 W. Ehringhaus St, Elizabeth City, NC, 27909 or 1001 Halstead Blvd Elizabeth City, NC 27909. Stop in for any of your auto or community needs, or feel free to give us a call at (252) 338-9100.